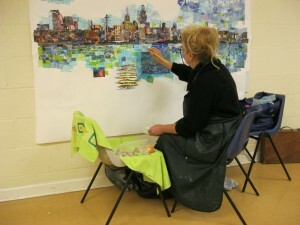 Drawing & painting in both watercolours and acrylics for both beginners and those more advanced. You will also be introduced to other mediums, such as pen & ink and Brusho. The classes are then ongoing through the year, enroling every 10 weeks with a break in August, so that you can keep learning. Life drawing, directly from the model, is also available. The majority of people who come to my classes are beginners, or artists who feel they need help to develop their art. Mostly people who may have retired and want to take up a long desired ambition of taking up painting. Other people still work and would like to take art up as a hobby. Some people have been to other classes, but have struggled and often become frustrated because the class isn’t structured. I structure my art classes to teach you all the basics and more, starting with how to draw accurately and in proportion. The class is also ideal for young students seeking to improve their skills prior to applying either to do a fine art degree or a foundation course. As I have done both myself, I can give you the help and advice to improve your chances. The aim over the first few weeks (or one Saturday per month at Lydiate) is for you to use paint in a confident way, to understand the basic principles that will allow you to progress on your own initiative. On week one, you will be introduced to the basic drawing skills such as measuring up a subject to achieve the correct proportions. 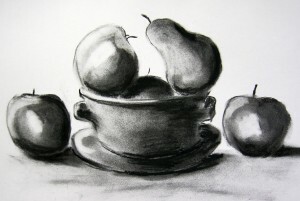 Often, even people who may have been painting for a number of years, have not been taught basic drawing techniques, for example: how to measure and achieve correct proportions. Without this, you will simply trust your eye and hope for the best, often failing to get correct proportions. The course will also deal with simple perspective. A good painting cannot sit on a badly drawn composition. Once you are happy with the basics, you will then move on to painting techniques, working from a still-life, set up in the class room. This will allow you to learn at your own pace in order to gain confidence in the acrylic medium and to experiment on personal technique. Initially, you will work in one colour, to gain knowledge of tone, before moving on to learn colour theory and how to mix colours. On the following weeks you will be able to work from your own favourite subject under my guidance.You can enrol for further weeks and keep learning; also take part in our regular exhibitions to allow you to display your work and sell. The cost of the ten week course is £75. The courses will then be ongoing through the year, with a month's break in August. You will be encouraged to expand and develop your art. Trying abstract; using pen and ink; gestural or free drawing; working bigger scale, as in the example of Hazel working on the Liverpool Waterfront. Payment for the course. You need to book first and pay the fee at the first class. If you are unsure if the class is for you, then feel free to ask for as much information you need, also to visit any of the classes before joining where I explain the course, what you will learn and you are happy. Once paid, I cannot offer any refund if after a few weeks you don't wish to continue for any reason, as I cannot fill your place. Some of the Sefton Art Group members visiting the summer exhibition at Tate Liverpool, 2018. We had the benefit of a lecture prior to viewing the Egon Schiele exhibition. Members gain great insights into an artist when viewing the paintings directly, which then feeds through into their knowledge.